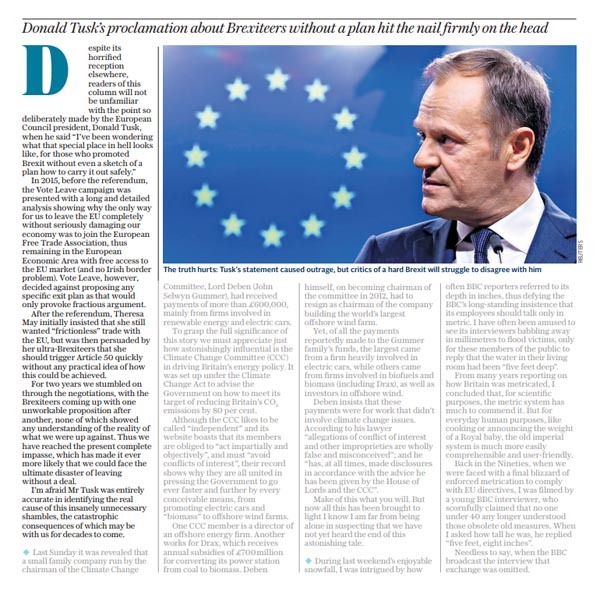 "Despite its reception elsewhere", Booker wrote for the Sunday Telegraph this week, "regular readers of this column will not be unfamiliar with the point so deliberately made by the European Council President Donald Tusk. This was when he said "I've been wondering what that special place in hell looks like, for those who promoted Brexit without even a sketch of a plan how to carry it out safely". In 2015, before the referendum, the Vote Leave campaign was presented by my expert friend Richard North with a long and detailed analysis showing why the only way for us completely leave the EU without seriously damaging our economy was to join the European Free Trade Association, thus remaining in the European Economic Area with free access to the EU market (and no Irish border problem). Vote Leave's director Dominic Cummings rejected this paper on the grounds that proposing any specific plan would only provoke fractious argument. In 2015, before the referendum, the Vote Leave campaign was presented with a long and detailed analysis showing why the only way for us to leave the EU completely without seriously damaging our economy was to join the European Free Trade Association, thus remaining in the European Economic Area with free access to the EU market (and no Irish border problem). Vote Leave, however, decided against proposing any specific exit plan as that would only provoke fractious argument. There is something particularly Soviet about this behaviour, redolent of May 1920 when Lenin gave a famous speech to a crowd of Soviet troops in Sverdlov Square, Moscow. In the foreground were Leon Trotsky and Lev Kamenev but, in later copies of this photograph, both these figures had completely disappeared. So it is here. Booker's "expert friend" Richard North is not allowed to appear in the column (except when occasionally allowed as Booker's co-author) and, since the favoured child Dominic Cummings is portrayed in an unfavourable light, the reference to him is discreetly erased from the record. One is reminded of Dr Tim Coles, author of Real Fake News who, in this clip ,talks of the "propaganda of omission" – keeping issues out of the public domain as a means of keeping them off the agenda. "If you're given facts and information", he says, "you can counter it, but if you're not told about key information and analysis, you can't even think about things". In respect of the Telegraph, Booker and I have been putting up with this for some years but, for me, the sentence is wider than just this newspaper. Not only have I been deliberately no-platformed by a wide variety of media organs, any mention of the exit plan we pioneered has been ruthlessly excluded from the debate. Despite over 100,000 downloads before the EU referendum, Flexcit is almost completely invisible. Yet, when it's convenient, we see a crack appear in the system, albeit a small crack, when columnist Juliet Samuel is allowed to make a brief reference to the plan. Writing in the Telegraph under the headline, "Brexiteers are rejecting exactly the kind of Brexit they used to want", she also picks up on Tusk's outburst, but with a difference. The reason why Brexiteers have "so spectacularly failed to take control of the negotiations over the last two years" she asserts, is not, as Donald Tusk claimed this week, that they had no plan. They were flush with plans – pamphlets, articles, speeches, journals. "There's Flexcit, a 400-page blueprint for leaving the EU over a 20-year period. There's Change or Go, a 1,000 page dossier laying out every option under the sun", she says, and "there might even be a feasible strategy for a no-deal". The problem, she avers, "is that the Brexiteers have so many plans and they change so often that they can't unite consistently behind any of them". Before we go any further, though, we should note that Mr Tusk was not exactly in analytical mode, complaining about a lack of any plan, per se. His precise concern was for those who promoted Brexit without even a sketch of a plan how to carry it out safely. That there were plans aplenty is not disputed – although Change or Go wasn't one of them. The problem was that, when it really mattered, the official leave campaign, Vote Leave, rejected in its entirety the concept of having a plan – any plan. Brexiteers weren't given a chance to unite behind a plan – there wasn't a formal plan around which they could unite. Had there been an open debate about the plan to adopt, and the campaign had broken up without a decision being made, then Juliet Samuel might have had a point. But what the campaign suffered from was that unique act of political cowardice on the part of Dominic Cummings and his colleagues, making a decision on behalf of the entire campaign, that there should be no plan. But there is another issue here as well, one which the Telegraph would never allow Juliet Samuel or any of its writers to make. And that is the failure of the media to question the absence of a plan – to scrutinise the leave campaign and bring it to account. Instead, the media went for the soft option of pursuing the personality-driven campaign that was presented to it, largely avoiding the technical issues or dealing with them at a very superficial level, usually on a "biff-bam" adversarial basis. During the campaign, though, there was one particular episode where David Cameron went to Iceland in late October 2015 and took the opportunity to denigrate our "Norway-style" future outside the EU, arguing that Britain would end up having the worst of all worlds if it adopted Norway's approach to the EU. Bizarrely, at that point, the entire leave "aristocracy" joined in to make common cause with Cameron. Ruth Lea blithely told British Influence that "we all agree … Norway is not the way" and John Redwood declared: "Eurosceptics don't want the Norwegian model". At the time, the Leave Alliance upped its tempo, with our group of bloggers actively supporting the Norway option. Yet, as I remarked at the time, nothing of this mattered to the guardians of ignorance. Of the legacy media, I wrote, "we are invisible – we simply don't exist. As for Flexcit, it is as if it was trapped in the enchanted forest, where the text fades to invisibility when viewed by someone from the inner circle". Nicholas Soames wearing pink socks in the House of Commons got more publicity than Flexcit gained throughout the referendum campaign. Not once were either Booker or I – authors of the seminal history of the EU, The Great Deception - interviewed by the BBC. Then and to a great extent now, there were two campaigns. The establishment-sanctioned effort, and the campaign run by the people. "We", I wrote, "are invisible. In the collective establishment mind, we don't exist as sentient entities. On voting day, we become the cannon fodder, to do as we are bidden". It is simply not good enough, therefore, to pick on the issue of the backstop, as it stands now, and point to the incoherence of the leave response. The reason why we have ended up with the backstop is because Mrs May, in her fateful Lancaster House speech, rejected the idea of our continued participation in the Single Market. And that, to a very great extent, goes back to that October in 2015 when both sides appeared to round on the Norway option. Not then, and not to this day, has any journalist gone into print to explain Flexcit, nor even to explore the Efta/EEA option properly. Mostly, when the hacks refer to Norway, they trot out the same tired clichés of "pay, no say", without the first idea of what they are talking about. … all of the following elements of Brexit: an end to EU budget payments, full control over immigration, total control over the services industries (including finance) that comprise 80 percent of our economy, substantially increased control over all other industries, the right to reject any future EU employment, environmental or social legislation, control over farming and fisheries and an end to the jurisdiction of EU courts. Even there, she is wrong. The backstop applies to Northern Ireland and delivers regulatory alignment in the province. The Withdrawal Agreement then takes us out of the EU but, in the longer-term, issues such as payments to the EU, immigration, services, and the other matters, will be determined during the talks on our future relationship. What we most certainly don't get is the structured relationship afforded by membership of the EEA, with its institutional provisions and mandatory consultation on new, EEA relevant laws. Thus, for all that Juliet Samuel has the luxury of a longer piece on the subject, it is still Booker who finishes off closer to the truth, despite the censorship from the Telegraph. Initially, he writes, "Theresa May insisted that she still wanted 'frictionless' trade with the EU, but was then persuaded by her ultra-Brexiteers that she should trigger Article 50 without any practical idea of how this could be achieved". For two years we stumbled on through the negotiations, he adds, with the Brexiteers coming up with one unworkable proposition after another, none of which showed any understanding of the reality of what we were up against, until we reached the present complete impasse, making it ever more likely that we could face the ultimate disaster of leaving without a deal. "I'm afraid" he concludes, "Tusk was entirely accurate in identifying the real cause of this insanely unnecessary shambles, the catastrophic consequences of which may be with us for decades to come". And it is so very telling that Booker is not allowed to disclose more about this "insanely unnecessary shambles".